Metaphysically, all crystals are believed to embody energetically healing properties. Lemurian Seed Crystals are powerful meditation tools which bring a feeling of temporarily coming home for those who feel isolated, lonely or that the earth is not their home. Lemurian Crystals were found in Brazil in 1999 lying separate in a bed of sand, unattached to clusters which is the normal way quartz points are found. It is said that these crystal were planted by the Lemurians within the Earth and they have a specialized purpose. About 12 million years ago there existed an advanced civilization somewhere between the American continent and Australia. Lemuria was peaceful and highly developed spiritually. During the last days of Lemuria, it was decided to plant seed crystals programmed to transmit a message of oneness. Having seeded the crystals, the Lemurian, it is believed, left this planet for other star systems. Others went into inner earth...while maintaining telepathic connection with those in other parts of the galaxy, where they continue to care for the earth and the seed crystals now surfacing. The crystals are thus connected to inner earth, the earth's surface, and the stars, and serve as a link to these various magnetic fields. Each seed crystal is energetically connected to all other seed crystals. This connection is a living example of the message of the Lemurian seed crystals. Teaching us how to be both individuals and integral parts of the cosmic design, that all beings are equal, and helping us to maintain our connection with our spiritual source while in a physical body. 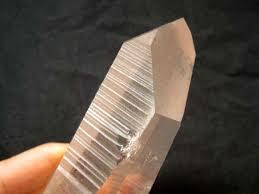 The striation, which to some observers have the appearance of being laser onto the crystals, contain this knowledge. Information from Katrina Raphaell's, "Crystal Trilogy."